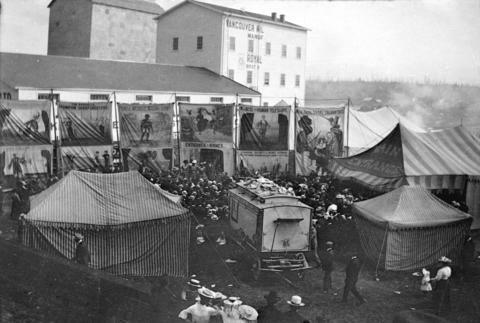 Photograph shows circus wagon, tents, side show back drops for the "Randalls Champion Sharpshooters", "Prince Mungo, Maori Chief", "William Dess The Human Telescope", "Mlle Zazel, Snake Enchantress" and crowds. Shows circus set up at Recreation Park, Smithe and Cambie. A print of this image is also available: see CVA 677-388.